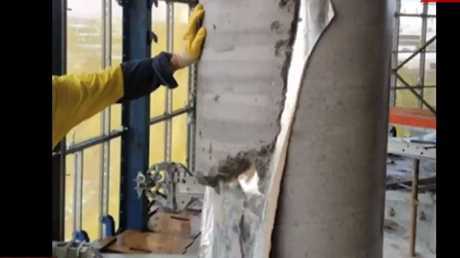 FOOTAGE captured by a construction worker during the building of Sydney's Opal Tower shows cement slabs riddled with cracks and crumbling support beams. 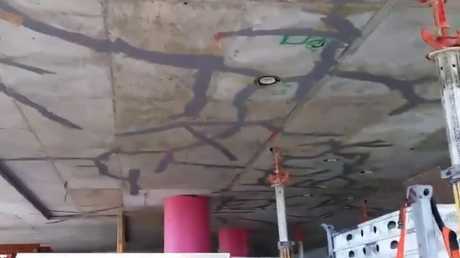 Video shows the 10th floor of the 36-storey Olympic Park building, where cracks in foundational structures are patched with filler. 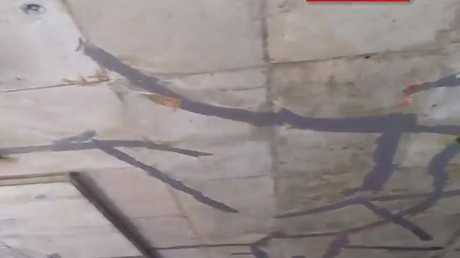 In some footage the support beams are taped by workers. Another concrete support beam appears to have been set with a plastic sheet stuck inside it. Severe cracks, which riddle the entirety of the concrete slabs between the 10th and 11th floor, have been hastily patched up with filler. The alarming footage was captured by a concerned whistleblower. Above the compromised concrete slab between the 10th and 11th floor and the crumbling support beams holding it up, sit 25 additional storeys. It's been nearly six weeks since residents of the Opal Tower were first evacuated on Christmas Eve after some noticed cracks in a wall. The concrete slab between the 10th and 11th floor is riddled with a spider web of cracks, patched with epoxy filler. 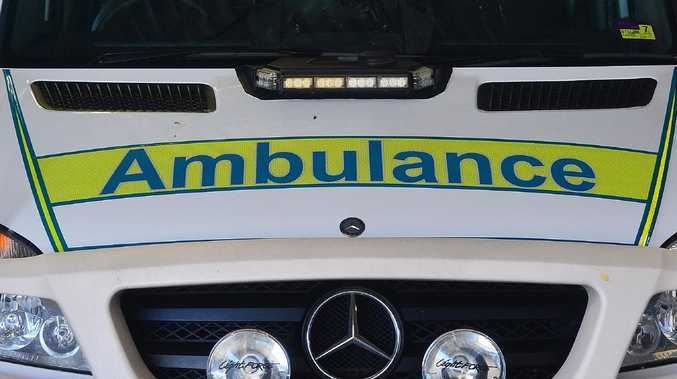 A group of residents who own units in the tower last week sent a letter to Prime Minister Scott Morrison, NSW Premier Gladys Berejiklian and state Planning Minister Anthony Roberts about the "pain, loss and deceit" they have experienced during the ordeal. They called on the State Government to assess the habitability of Opal Tower and to ensure those behind the "crisis" take responsibility. Some of the residents of the units cleared for return have refused to move back because they say the building is still a "construction zone". Design engineers WSP maintains the building is structurally sound overall - a verdict also made by the government's independent engineering experts. However, the whistleblower who worked on the project disagrees. "It's a patch up job," he told A Current Affair last night. "We could see daylight from floor to floor. "You could drop a two inch nail right through to the floor below. "It's not just one little unit," he added, saying he and other workers felt the entire floor was compromised and should have been removed. 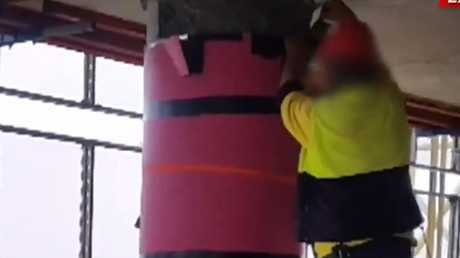 A support pillar is taped up by a construction worker. "It wasn't just two or three metres square … It was 20 metres long." He said he and other workers felt the entire floor should have been removed. Instead the problem was patched up with filler and the construction firm went ahead with the construction of a further 25 storeys on top of the compromised level. "That building has a lot of problems, more than what we know about at this stage," said Phil Dwyer from the Builder's Collective of Australia. "There's no other word for it. It's just appalling." Residents of nearly 100 apartments were encouraged to move back into their homes with the constructions firm Icon cutting of their payments for food and accommodation last Sunday. The company's corporate engineer, Cardno, declared 97 apartments safe and ready to be occupied. However, there are a number of apartments not ready to be reoccupied, and Icon has extended their payments to February 9. "It is important to note that the we are continuing to work with all the engineers to ensure all queries are thoroughly addressed and that the extent of apartments with actual remedial works is minimal," Icon said in a statement on Sunday. The alarming footage shows extensive cracking across the concrete slab patched with filler. A concrete support pillar on the tenth floor is set with plastic sheet stuck inside of it.